It seems like everything is measured in hertz. Cordless phones and broadcast antennas are in megahertz, and computer power is measured in gigahertz. Power coming from the wall and television refresh rates are measured in hertz, too. This guy Hertz sure gets around. Hang around electricity long enough and you will hear all sorts of measurements: volts, watts, amps (amperes), coloumbs, ohms, hertz… and you might stop to think about how these things got their names. Every single one of those measurements comes from a pioneer in the field of electricity. The hertz was named for Heinrich Hertz, and if it weren’t for Herr Hertz, we wouldn’t have broadcasting, electric lights, or anything with a computer chip. He did a lot of research into early radio transmission. He discovered and understood a lot of how electricity flows from one place to another. In the 19th century, electricity went from being a curiosity to a necessity. People in 1800 didn’t know much about electricity, other than seeing sparks fly from point to point on a dry day or seeing bolts of lightning. There was nothing terribly useful about that. By 1900 homes had electricity, communication by telegraph and telephone was common and radio broadcasting was just about to take off. 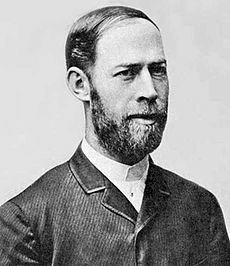 What happened in the meantime was due to engineers like Heinrich Hertz. Herr Hertz lived in what is now Germany, and while he wasn’t the first person to broadcast radio waves, he was the first person to prove he had done so. He did this by oscillatingelectricity in a fixed pattern. By creating a unique, distinctive pattern in his broadcasts and then proving he could duplicate that pattern in a receiver, he proved that radio transmission was a good way to send sound or telegraph transmissions, and eventually his work led up to the development of the TV tube and TV broadcasting. Think about it. At this time no one really knew or understood whether radio or even electricity could be reliably measured. It was all very hit or miss; even the great inventor Edison just kept trying things until they work. It was Hertz who came up with a lot of the rules we take for granted, and along with colleagues all over the world he brought the world into the modern age. Herr Hertz died at the age of 36 after several astoundingly productive years. His ailment was almost always fatal in those days, although simple steroid treatment is used today. He was awarded the Nobel Prize in his day, and in 1930, the term hertz, corresponding to cycles per second, was established to permanently honor him. Alternating current, the kind that comes from a wall outlet, alternates at 60 hertz in North America and 50 hertz in Europe. For that reason, televisions also refresh at 60Hz. Radio waves are a lot smaller than alternating current waves. AM radios use a carrier frequency of 540,000 – 1,610,000 Hz (or 540-1610 kHz) while satellite TV transmissions actually go up into the 40GHz band. All this means is that the basic wave, before it has any information encoded into it, repeats an astounding 40,000,000,000 times every second. A computer with a processor speed of 2.2GHz can process 2,200,000,000 instructions per second, which is astounding considering that people can usually process about one instruction every other minute. We owe a lot to Heinrich Hertz and his successful transmission of radio waves.